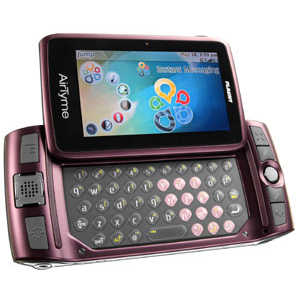 Airtyme launches cheapest 3g phone (HSDPA upto 7.2 Mbps HSUPA upto 2.0 Mbps) at rs4999. AirTyme communications, a US based mobile handset brand , has announced the launch of an affordable 3G HSDPA phone at Rs.4999. The phone has easy-to-use screen icons and keyboard which make it a fun device for keeping in touch with friends and family. The FLAUNT comes with a stereo Bluetooth option for a music experience without wires. Other profiles for Bluetooth include A2DP (Advanced Audio Distribution Profile) and DUN (Dial-Up Networking profile ) .The DUN profile allows users to tether the phone as a modem for their computer without cables for dial up internet access. The main feature of this phone is internet 3g speed upto 7.2 mbps which is not seen in lower end prices phones. The phone has good speaker quality and can record 3GP video and play music and video in MP3, 3GP and MP4 formats. Phone’s multimedia features also include a 3.2 megapixel camera, which allow users to capture life’s many moments in 1280 x 960 pixels. This pocket friendly phone also offers social media options like Snaptu and, Nimbuzz. It also supports Google Maps.TORRID is available in three striking colors – Green, Orange and Grey – to complement each user’s individual style. To address to after sales service concern of customers, the company has around 400 service center network spread across India. Experience the AirTyme Flaunt that comes with a large 3.2 inch display and slide-out QWERTY keypad that gives you the best of both worlds. Its high-speed 3G lets you stay in touch with friends and family always. Expand your social network with its fun-filled applications like Yahoo, MSN, Gtlak, AOL Instant Messenger. Share more with your buddies using its Bluetooth technology. Enjoy the best of multimedia as the Flaunt comes with an audio-video player that is compatible with multiple formats. Capture cool moments with its 3.2 Megapixel camera and upload bright pictures online instantly. With its powerful battery, enjoy long hours of conversation and have endless fun with applications.